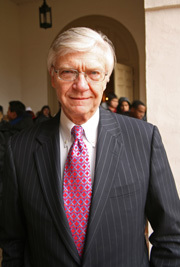 William & Mary President Taylor Reveley sent the following message to the College community Dec. 18 regarding the state budget. -Ed. In response to the Commonwealth’s severe revenue losses, Governor Kaine has recommended to the General Assembly that state funding be cut by 15 percent for all four-year colleges and universities in Virginia for the fiscal year beginning July 1, 2009. For the College, this represents an additional 8 percent reduction above the 7 percent we were required to absorb in October. The Governor also recommends eliminating all state support for the Eminent Scholars matching program. If approved by the legislature, these two cuts will total approximately $8.6 million for William & Mary. To date, we have identified just over $2.1 million in base savings that can be applied against these cuts. For the Governor’s speech to the budget committees of the General Assembly, see www.governor.virginia.gov/MediaRelations/NewsReleases/viewRelease.cfm?id=838. These proposed actions will not affect William & Mary’s operations during the current fiscal year, nor will they impact our building projects. To repeat prior assurances about the current fiscal year, there will be no layoffs on the main campus, no salary reductions or furloughs, no loss of student financial aid, and no mid-year tuition increase. As part of his proposal, the Governor has removed all state support for faculty and staff salary increases until, at the earliest, July 2010. What we at William & Mary should do about salaries and staffing will be among the factors considered by the Board of Visitors next spring when it adopts a budget for fiscal year 2010. Our planning for that budget remains a work in progress. As always, we will work to absorb the latest cuts in our state funding with the least harm to the university, and we will report to you once plans are further along.